Used by repair technicians, service professionals, IT departments, hobbyists and more, Service Center shortens diagnostic time and reduces parts usage on the bench or in the field. Now with Certified NIST-Compliant Drive Erase and FREE cloud reporting! Optional remote diagnostics also available! Save Time. Reduce Costs. Increase Profits. 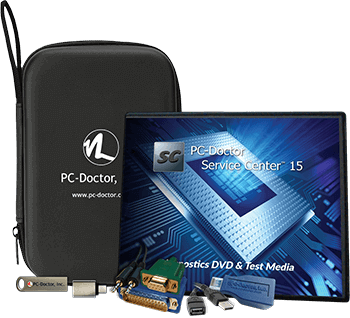 Service Center provides the same PC-Doctor diagnostic tools used by the world's top original equipment manufacturers to increase testing accuracy and troubleshoot more efficiently. Use it to identify hardware issues—even intermittent ones—then complete the repairs and verify the problems no longer exist. 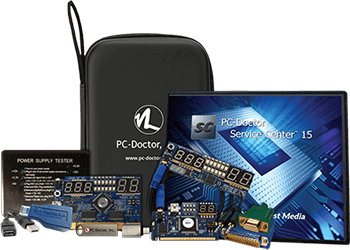 Service Center provides four great diagnostic environments on a single USB key, allowing technicians easy access to Windows, DOS, and Bootable Diagnostics — with Mac, Android and full Windows 10 support. Diagnostic sessions from all four testing environments are easily combined on the USB key to give your customer a complete picture of testing performed. The Multipurpose USB Device indicates test status and stores configuration files, customizable reports, system snapshots, your customized links, Drive Erase options, and other useful information. More than 500 diagnostics for PC, Android, and Mac devices. Branded reports include company name, technician's name, company logo, and more. Compare system configuration profiles before and after repairs. Certified NIST-Compliant with cloud accessible and printable erasure reports. Five predefined, broad-coverage test scripts or an unlimited number of custom test scripts. Quick acces links to user-defined test scripts, favorite Web addresses, and local files. Quickly identify problems reported by Device Manager or the Windows Event Log. Full Featured. Complete coverage. Total Control. "If you're serious about hitting deadlines, serious about building business volume, you have to have PC-Doctor as a front line tool." 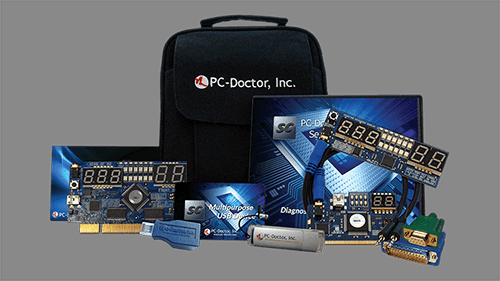 "As an IT consulting firm, we reduced our return rate from 70% to 3% within six months of adopting the PC-Doctor Service Center hardware diagnostics." "Bottom line, it paid for itself in the first week of use. It's been a long time since I measured an ROI in hours!" This kit is also available as a 3-pack, which includes 3 Multipurpose USB Devices. Save money and test more systems at once!